Khaki jacket - Very Alexa Chung, don't you think? Wear with the bluest jeans and whitest sneakers to complete the look. Trench coat - I do love a long coat, but being tan and in this faux suede sort of material, this coat ticks two extra boxes. Cat purse - How cute is this purse?! Forever the crazy cat lady, I definitely need one of these in my life! Suede lattice mules - I love cut out shoes and this tan coloured slip on pair would look perfect set against deep blue jeans. Spotty box bag - A dead ringer for the Reiss box bags - but for a fraction of the price! Tan pencil skirt - The perfect rust / tan colour. I would style this with a simple white blouse tucked in for lady-like elegance. Tan leather jacket - .... ok faux leather, but looks pretty realistic, don't you think? Textured wool jacket - This reminds me of a jacket I once bought (from another store) which I loved but returned as I couldn't justify the price. This jacket from M&S is a cheaper alternative to the one I saw before, but looks every inch as luxe. Printed culottes - I've never owned a pair of culottes before, but I love this print of these ones so much I may now have to! Lace off the shoulder dress - I love this style of dress. I found a similar one lately elsewhere but the quality was so poor in comparison (sheer, paper thin and really, really short). This M&S offering is a much better length. Graffiti print shirt - How eye catching is the print on this shirt?? It looks so high fashion and would look great paired with a leather skirt or worn underneath a jumpsuit or play suit. Light blue sweater - The sweater of dreams. I need this in my wardrobe tomorrow yesterday. Foil print skirt - This A line skirt looks almost oriental, so is great for that East meets West look. I love the metallic jacquard print set against the khaki colouring of the skirt. I know this feature may seem more directed to my UK readers than my overseas readers, but nothing could be further from the truth! Marks & Spencer does ship abroad to over 30 countries and has dedicated websites for Europe, the US and so on. So if you like any of the above and aren't from the United Kingdom, it isn't necessary game over for you! 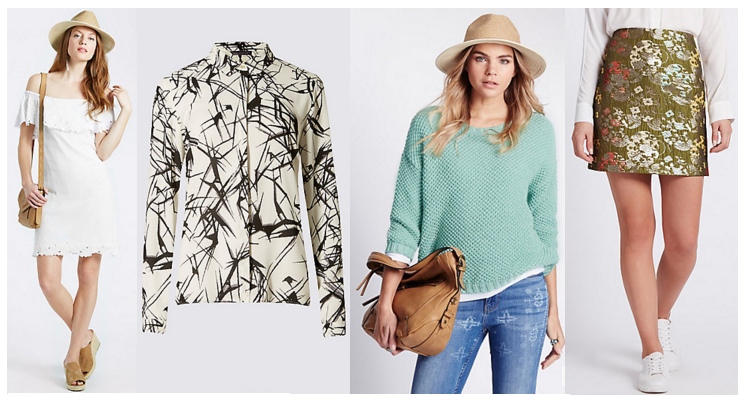 Which items from Marks & Spencer are your favourites?